Choose static cling window stickers (also called self cling window stickers) for any promotion or special offer. No glue to clean, No adhesive to remove. 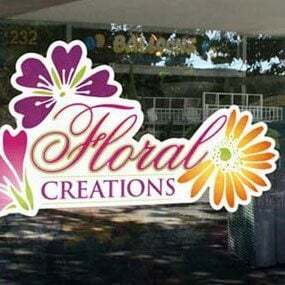 Static cling window stickers use just static from the surface of any glass surface to hold them in place. Static cling window stickers will make installing or removing promotions from your window easy. When the offer is over you can easily peel the decal away, with no fuss, no sticky residue and no effort. PLUS, you can also re-use it time and time again. Our static cling printed stickers are produced on white material, for placement on the inside of windows – facing out. They can be cut to any contour shape, even as a one-off. Window clings can be printed at up to 1.25m high by any length. Great product, we are now putting these in all our customer vehicles to remind them of their next due test. We are delighted with our window stickers, they are beautifully printed and simple to use. Unlike normal self-adhesive vinyls or even removable vinyls, our Static Cling Window Stickers can be used time and time again. Easy to apply, easy to remove and store, always looking amazing! Our window clings can be fitted easily, removed, repositioned and re-used again and again. Mainlu used on windows, these stickers can be used on any smooth surface. We can produce static cling window stickers to any shape or size to suit your window display requirements. Unlike other suppliers we are not limited to print coverage thanks to the quality and specification of our printing machines. Static Cling Stickers are far more cost-effective than single-use self-adhesive vinyls. You can use them for Daily Specials once a week or for regular events – and re-use them the next time you need to. Glass cling stickers are printed on our high quality latex or eco-solvent printing machine. These use environmentally friendly inks. Use Self Cling Window Stickers for short-term stickers, removable stickers, sale graphics, car window stickers, parking permit stickers, shop promotions. Ensure the glass is clean from grease and dirt. Do not use silicon based cleaning products. Take care applying to cold glass as initial adhesion will be reduced. Apply direct to the window from the backing liner. Note: If the printed face is applied directly to the window it may leave some print residue which can be cleaned after removal. Static Cling Window Stickers can be cut to complex shapes, call us for details and advice on how to create your cut line. Standard delivery turnaround is 3 working days from confirmation. Need it quicker? Call us for details. Free shipping is available for orders over £250. Are Static Cling Stickers easy to fit? Yes they are, just follow our simple guide. Can Static Cling Stickers be re-used? Yes, you can re-use static cling stickers as many times as you want. We advise keeping the backing paper if you are going to store them.